The Truth About Satanic Ritual Abuse Talk with Sandra Fecht. 2015 First time interview with Sandra Fecht MA, Physiotherapist in Ontario, Canada. Also joined by 2 of her clients who have both been victims of cult abuse since childhood. Explains how evidence is destroyed and her complaints about local cult members are deleted by police as the are passed within the police force. It is always denial at first and that is how we lose hope and allow such ritual abuse to continue generation after generation simply because we cannot believe what these people are saying. 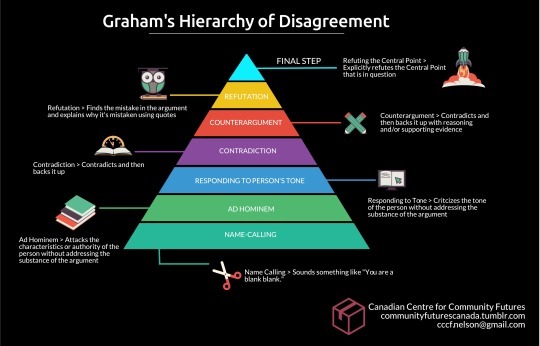 It is the first step in the process of denial and disagreement in the Graham Hierarchy of Disagreement. First deny then engage in name calling and then attack the character or tone of the person saying something that challenges your current world view. It was not a joke and it was not something that should have been something as jest, but unfortunately it was.